Like painters, Renaissance sculptors were influenced by the humanist interest in realism. They were also inspired by ancient Roman statues dug up from ruins. Sculptors began carving figures that looked like real people. For the first time since the days of ancient Greece and Rome, sculptors made freestanding statues that could be viewed on all sides. This was very different from the sculptures of medieval times. The new statues caused a sensation. They seemed to symbolize the humanist ideals of nature, realism, and the importance of the individual. The Work of Donatello A Florentine artist named Donatello was one of the first sculptors to use the new, more lifelike style. His work expressed personality and mood. A good example is his life-sized statue of David, the young warrior in the Bible story of David and Goliath. In the 1500s, Giorgio Vasari, an architect and painter, wrote that Donatello’s David is “so natural . . . it is almost impossible . . . to believe it was not molded on the living form.” This statue is thought to be the first freestanding statue since ancient times. 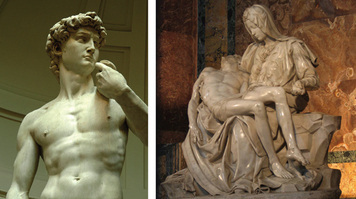 The Work of Michelangelo Donatello’s sculpture influenced Michelangelo, another great artist of the Renaissance. Michelangelo is known for both for his painting and his sculpture. He was also a talented poet and architect. Of all these arts, he preferred sculpture because it seemed to bring his subjects to life. Michelangelo created his own majestic statue of David. It may be the world’s most widely admired sculpture. Carved in white marble, Michelangelo’s David stands about seventeen feet tall. The statue’s expression shows the concentration and tension of a real youth on the verge of battle. Michelangelo’s David was installed in the Piazza della Signoria, the plaza in front of the Palazzo Vecchio. It became the prized expression of Renaissance genius in Florence, and Michelangelo had an enormous influence on other artists.